Thanks so much to everyone who stopped by for my Let's Get Acquainted Blog Hop post on Tuesday. It was great to be able to share a little more of myself with all of you, and I'm glad that you enjoyed the tutorial. Your kind comments were so appreciated! Be sure to stop by Jodi's post today at Tickle and Hide. She has a darling quilt to share along with dozens of other adorable projects on her blog. Jodi makes some of the sweetest clothes for kids that you'll find online! Libby from Miss Beau Jangles is also posting today. I've known Libby for a while now, and she's fantastic. Check out her great drawstring bag pattern tutorial today...I need to make one of these! See you tomorrow...hopefully with a finished quilt to share! For those of you who are visiting for the first time, welcome to Fabric Mutt! Sewing has been a new adventure for me this past year. After being a teacher for nine years and an assistant principal for one, I decided to become a stay-at-home mom in 2009. It was a big change for me after working since I was a teenager, and it took a while for me to find my balance. When my mom brought a new sewing machine into our home last fall, she opened up a whole new world to me. I immediately began looking for inspiration on the web, and I was amazed at the treasure trove that I found in the online quilting community. By the end of December 2011, I decided to start Fabric Mutt as a way to share my projects with my out-of-state family as well as track my own progress. 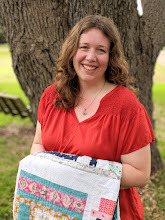 It’s been incredible to connect with so many other bloggers who share my love of sewing! I live in a busy Southern California household. My husband and I bought a home with my parents four years ago, and we also share the space with our three little girls, affectionately known as Bunny (5), Bear (3), and Mouse (1½). It’s a fantastic situation for us, and we enjoy lots of family time together. With all of the chores and child care involved in daily life, sewing doesn’t always happen as easily as I’d like it to, but I manage to fit it in as I go along. How long have you been quilting? About 7 months. It feels like it’s been a lot longer than that to me! Favorite quilting tips? Don’t be afraid to try anything. I feel like I’ve gone through a series of terrors in my sewing – afraid to try making my own binding, to put in a zipper, to try paper piecing, etc. If you’re afraid of it, then make yourself do it. I usually find that it’s not nearly so awful as I thought it was, and each accomplishment opens up a new world of projects that you can do. Favorite blogging tips? 1) Be yourself – it’s your blog, after all, and no one else’s. 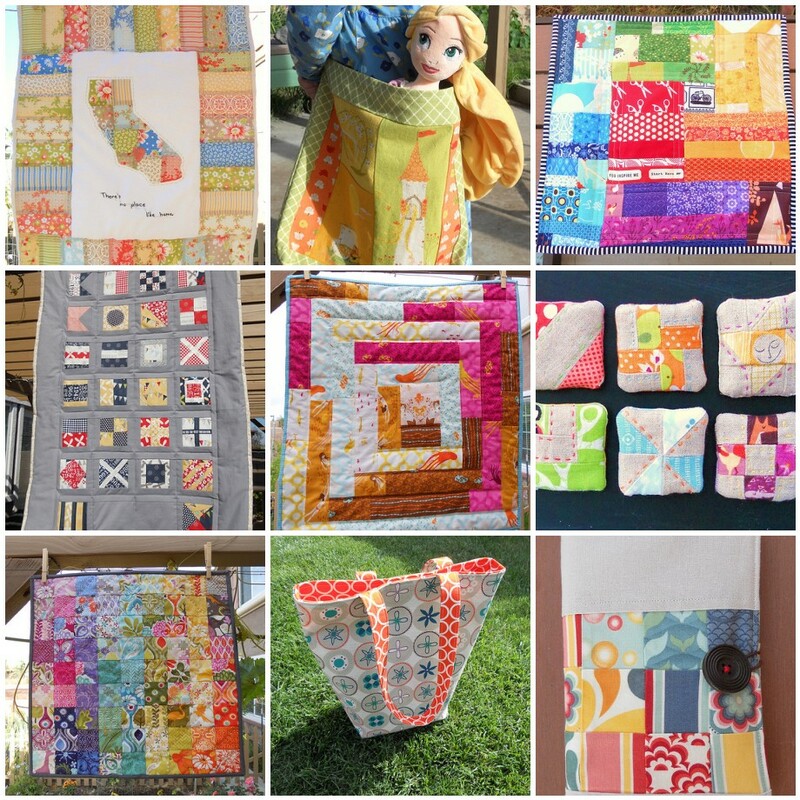 2) Get involved with the online quilting world – linky parties, swaps, sew alongs, etc. This is how you meet people and how they meet you -- however… 3) Don’t overbook yourself. If you try to join every single event happening in blogland, you will eventually burn out…trust me on this one. Favorite fabric? I love anything by Kate Spain, Melody Miller, Heather Ross, Denyse Schmidt…how many favorites am I allowed to have? Favorite craft book? Zakka Style by Rashida Coleman-Hale. It’s changed my sewing forever. Binding - by hand or by machine? By hand…it’s a ton of work, but it looks so beautiful when you’re done! If I'd only known - what you wish you knew about blogging before you started your blog: Don’t lose your joy in pursuit of perfection. It’s easy to feel discouraged because your numbers aren’t as big as someone else’s, because you’re not getting packages of free fabric from designers, or because your quilts don’t look as perfect as the other ones in the linky party. You have to start somewhere, just like everybody else did. And hey, this is supposed to be fun! So . . . on to the tutorial portion of the post! I've been experimenting a lot lately with different types of bags, pouches, and portfolios after doing the projects in Zakka Style as well as a portfolio pattern from the upcoming Pretty in Patchwork: Holidays. That experimentation led me to today's project: the Quiet Pack. Every summer we take a road trip to visit my parents-in-law in Arizona. The visit itself is always fantastic, but eight hours in the car with three little girls? Not so much. This year I intend to be well armed with entertainment for the kids, and I thought a helpful tool might be some Quiet Packs. These are really just simple portfolios equipped with some cloth "toys" and space for picture books. Some people like to add room for a pad of paper and crayons, but I don't let my girls have crayons in the car anymore ever since the time Bunny drew all over the inside of our old Corolla with a green crayon . . . not a day to remember fondly, believe me. The great thing about this project, though, is that you can customize it in so many ways. Sew a few extra seams down the pockets, and you've got slots for crayons (if your kids are more trustworthy than mine). Add some velcro pieces to the inside, and you have a portable tic-tac-toe game. Hey, use a grown up fabric and make a pack for yourself! The tutorial is just a jumping off point...make this project whatever you want it to be. For my fabric, I used the Woodland Tails collection by Sheri Berry Designs for Riley Blake. It's not only adorable, but it features the three animals that represent my daughters' nicknames: Bunny, Bear & Mouse. I'm using the large round pictures from the cheater quilt print as decorations for the outside of each pack so that my girls can quickly see which pack belongs to them. Use a quarter inch seam allowance for all sewing unless I mention otherwise. Okay, let's get this party started! About 1 yard of material (make it 1.25 if you want to be safe -- I always like to have a little extra on hand in case of mistakes) in a variety of different prints -- your design, so you get to choose! 2. Use a zig zag stitch to applique the decoration to the exterior of your pack (I often use fabric glue to hold it in place before I start sewing). I just folded the exterior fabric in half, centered the circle on the front, and then moved it slightly to the left to account for the seam allowance around the outside. I also went around the circle twice to be sure that it was firmly attached since this is such a large piece of fabric, and I know it's going to get a lot of use. 3. Fuse all pieces of fabric to their appropriate backings (see the information under step one). 4. Place the interior pieces with their right sides together and stitch along the center line. Unfold them and press the seam allowance open. 5. Fold the fabric for the inside pocket in half length wise, press, and top stitch about a quarter inch away from the fold. 6. Pin the pocket in place along the bottom and sides of the interior and stitch all along the matching raw edges of the pocket to secure it in place. Then sew straight down the middle of the pocket to create two pockets. 7. Sew the two flap pieces together, right sides facing, along three sides -- being sure to leave the fourth side open. 8. Clip the corners, turn the piece inside out, push out the corners with a chopstick, and press. Center half of your 4.5" velcro strip (I put the scratchier side on the flap, myself) on the end opposite the opening, leaving about a quarter inch around it on three sides. Secure it with fabric glue, then stitch all the way around the sides of the velcro once or twice. 10. Sandwich the flap between the exterior and interior (right sides together), centering it on the short side with the applique. Be sure that the exterior side of the flap is facing the exterior's right side. Let about an inch of the flap (the end with the opening), hang outside. Pin along all the raw edges. 11. Stitch a quarter to a half inch along all the raw edges of the pack, leaving an approximately five to six inch opening on the long side opposite the pocket for turning. Clip the corners and turn inside out, pushing out the corners with a chopstick. Give the pack a nice pressing all over, turn the remaining open raw edges inside to match the sewn edges, and stitch an eighth to a quarter inch from the edge around the entire exterior of the pack. Turn the pack over and sew one final seam down the center fold of the interior, all the way down through the pocket. 12. If you like, you can make some little characters to go with your pack. I fussy cut 2.5" squares with an animal in the center of each one, fused them to interfacing, and then sewed them (right sides together) with a backing print along three sides. I turned them inside out, turned in the edges of the open side, and stitched all along the edge of each square. My girls will play with these guys against the forest backdrop on the left interior of the pack, but you could easily use these pieces for a matching game, tic-tac-toe, etc. You're done! Fill up your pack with goodies, and enjoy! If you make a Quiet Pack of your own, be sure to link up with Monday's Let's Get Acquainted Linky Party at Plum and June so that we can all admire your beautiful work! Please be sure to leave me a comment letting me know if this is a helpful tutorial for you. I'd also love to hear what you think of Fabric Mutt -- the design, the photos, the content . . . comments and suggestions are always welcome here! Thanks so much for stopping by today, and come back to visit again. I'd love to see you here! This morning we heard that the father of one of Bunny's friends died suddenly of a massive heart attack yesterday. He leaves behind a wife and four children. Only a few weeks ago I was chatting with his wife about the challenges of raising our little girls, and now she faces the reality of doing it alone. I can hardly grasp it. It may seem out of place to share this on a sewing blog, but after spending some time in tears this morning, I also spent a short while in thought. I began sewing last fall for several reasons. It was partly for myself -- I needed a creative outlet. But it was also for my family; I wanted a tangible way to share my love with them. Yet when I honestly think about how much time I devote to sewing and blogging and scouting for inspiration online...well, I feel as though my family has sometimes gotten the shorter end of the stick. That's not the way I want it to be. I love my sewing, and I have no plans to give it up. The online quilting community will continue to be a place where I enjoy whiling away my small amount of spare time. But I don't want to forget what's most important in my life. So the next time I'm in the middle of a project and those little faces peek at me around the end of my sewing machine, I'm giving myself permission to take a hug break. After all, some things just can't wait. It was a happy Friday indeed today. As my family was pulling out of the driveway to go have lunch and run errands, the postman came by with a few packages. Guess what was inside one of them? Tara -- or missabeat, as she's known to us in the Modern She Made Swap -- put together this incredible surprise for me. I love everything about it: the patterns, the colors, the fabrics...all perfection. Just yesterday I was thinking about making a bag to hold my sewing when I'm out and about, and this one will be exactly what I need. I love the little pouch attached to a key ring on the side...so handy. The pincushion is darling; Bear grabbed it immediately and started running around the room with it calling, "Mommy, this is bee-yooo-ti-fullll!" And the fabric scraps...gorgeous prints that I'm just crazy about! I'm so excited to use these little beauties. Tara, you made my day. Bless you. I am in my first bee ever, and my month comes up this summer! My hope is to dig into that and make a fabulous bee quilt! Congrats, Miss Mary! I've sent you an email. As soon as you send me your address, I'll have the package headed your way. My husband has a four day weekend from teaching starting today -- a marvelous glimpse of things to come. Only one more week and he's off for the summer. I can't wait! I had planned to make the full size Zakka Block Quilt this week, but when I thought about the fact that I still have the girls' three quilts to finish as well as our own quilt to start -- well, it seemed like throwing another lap quilt into the mix was a bad idea. The solution? Make it a mini. I've been hanging on to a charm pack of Liz Scott's Domestic Bliss collection for a while now. I pulled out eight squares and cut them into quarters, then paired them with a grey colored linen blend for the front. I added a few full size charm squares for the back along with a pink herringbone print from Joel Dewberry's Modern Meadow. The piece is quilted in a simple zig zag pattern and bound in the same grey linen. Linking up to TNT Thursday & the Zakka Along. I had several little things to mention today, so I thought I'd put them all together in one post. First, I finished another item off my small projects list -- a little wristlet pouch that will be a birthday gift for a friend. I used some of my precious Melody Miller fabric for the outside and a little Modern Meadow by Joel Dewberry for the inside and strap. If you haven't yet entered my Sew Mama Sew Giveaway yet, you can jump on the bandwagon right here. I have to say that Giveaway Day is a blast, but exhausting. Did anyone else start going cross eyed from entering so many giveaways yesterday? I had to take a break in the afternoon and go back to it last night and this morning. There are so many great blogs out there! The Let's Get Acquainted Blog Hop starts today with posts by Kelsey & Erin. Be sure to stop by and give them some encouragement -- they've both got great projects to share! Finally, I joined up with C&T Publishing's Creative Troupe earlier this month, a sort of volunteer feedback group to the company behind the phenomenal Stash Books. One of the things we get to do is review online copies of their books, and I was very excited to get the chance to check out some titles that I haven't been able to purchase yet. 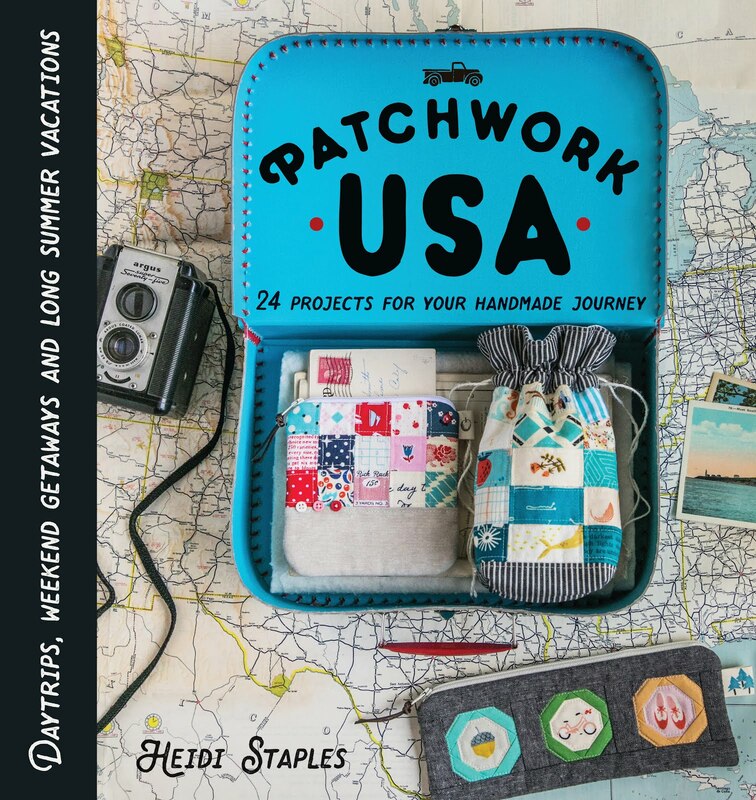 I decided to start with The Practical Guide to Patchwork by Elizabeth Hartman of the popular blog Oh, Fransson! Elizabeth is a big name in the modern quilting world and for good reason. Her projects are sleek and sophisticated, yet completely approachable. If you are just starting out into the world of modern quilting -- or quilting, period -- you would do very well to get a copy of this book. Elizabeth begins with a large section on the basics of quilting, giving a comprehensive overview of techniques, supplies, and standard quilting terms. She then presents three sections of quilt projects, each one taking the reader to a slightly higher level of difficulty. I'm particularly in love with her Valentine quilt, a stunning rainbow hued string quilt (you can see a version of it here). There are twelve quilt patterns in all, beautifully illustrated and explained in detail. I especially love her notes at the end of each project where she shows two different spins on the quilt just presented (i.e. make it scrappy, fussy, vintage, etc.). She gives the reader a framework to build on and the tools to be as creative as possible. This book is a great addition to any quilter's library, and I would love to try at least one of these patterns in the year ahead.